I played with some distress inks and watercolored a couple of random SU flowers after embossing them with white EP. 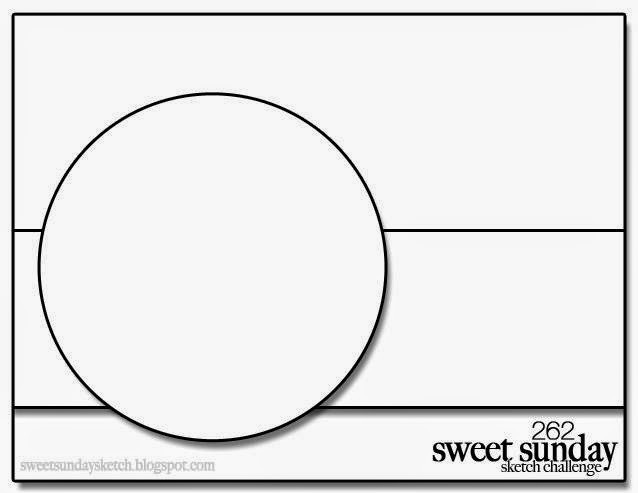 After seeing the Sweet Sunday Sketch Challenge, I decided to adapt the image to fit the layout. I added some freehand leaves with an aquapainter and Peeled Paint distress ink. The background quilted die and the stitched circle and skinny rectangle are dies by Lil' Inker Designs. The sentiment die is Hand Lettered Hello by WPlus9. 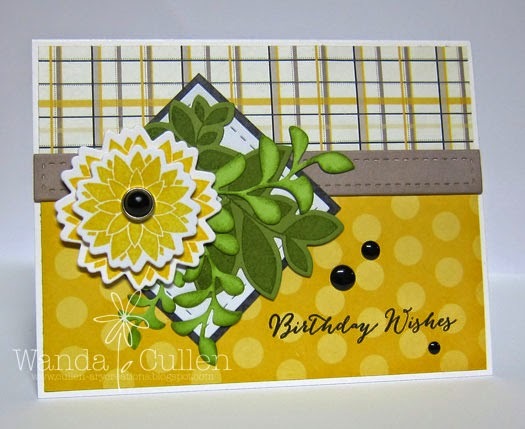 Cardstock is Lemon Tart and Hawaiian Shores by PTI. INKS: Tumbled Glass, Squeezed Lemonade, Peeled Paint by Tim Holtz. Good Monday everyone! 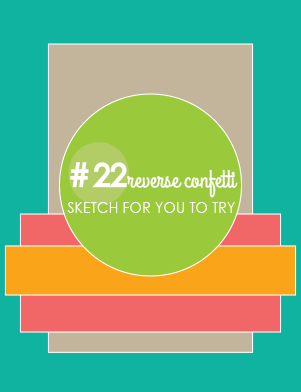 There's an awesome tall and skinny sketch for the Mojo Monday Challenge this week with lots of layers going on! 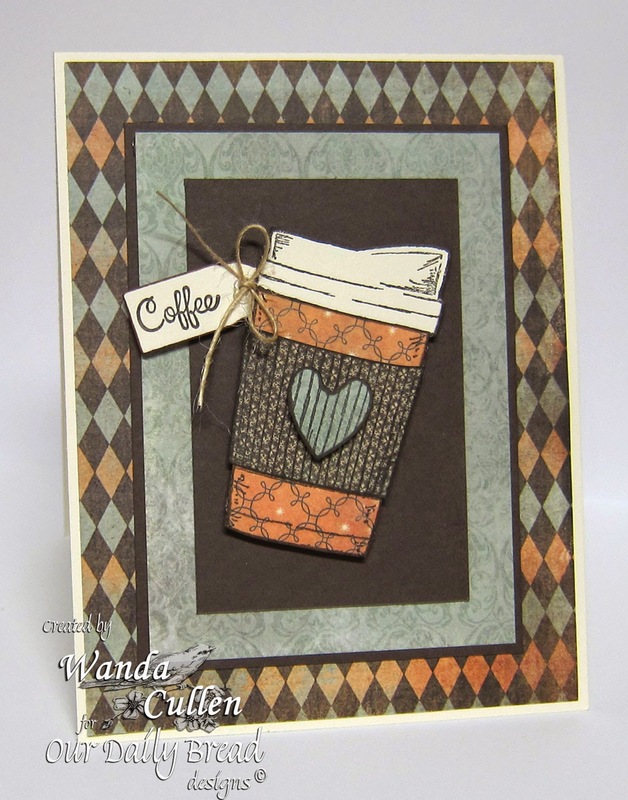 I chose to spotlight this sweet cup of joe from Verve's Delightful and Delicious set. The sequins are from the Holiday Sequin Mix by Verve...perfect to balance out the design! My card is 3 1/2" x 5 1/2". STAMPS: Delightful and Delicious (Verve). PAPER: Under the Tree specialty designer paper by SU; Vintage Cream by PTI. INK: Chocolate Chip, Cherry Cobbler. 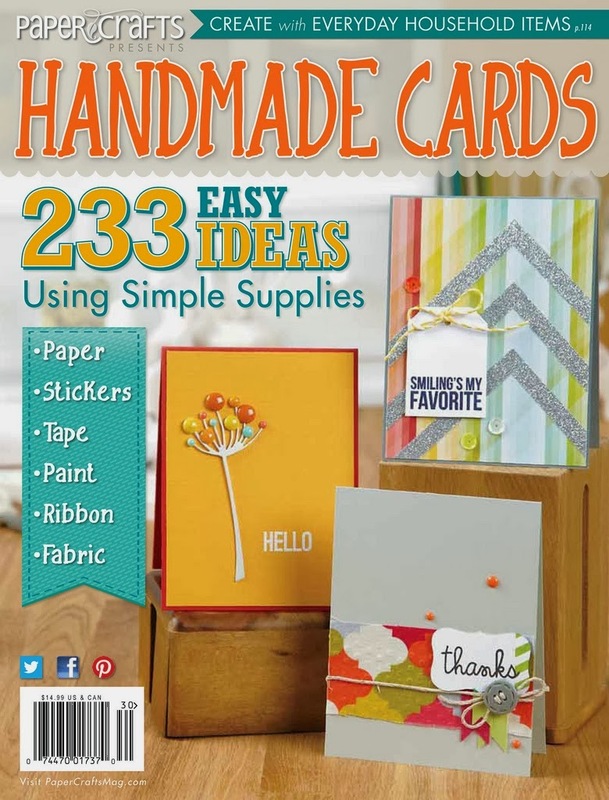 DIES: Stitched dies by Lil Inker Designs; Mini Tag die by PTI. I'm joining in with the new release hop over at North Coast Creations this month! 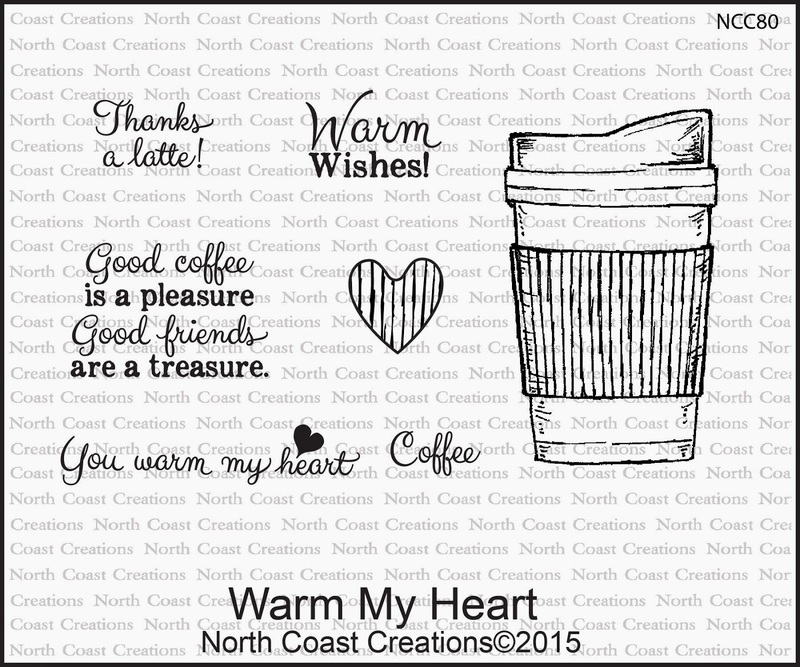 As a coffee lover, I was excited to see this new Warm My Heart stamp set. This will be a 'go to' set for the popular coffee hops that are all over blog land! I paper pieced the cup and popped the heart on foam tape. 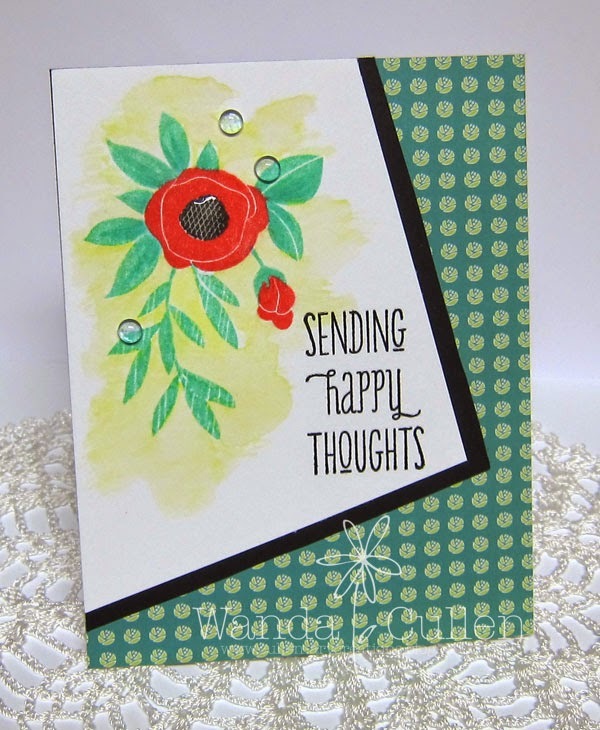 The sentiments were cut using the ODBD Mini Tag and Pennant Die sets. I sponged the TCW Mini Coffee Splotch stencil using Soft Suede ink before adhering the doily. The ODBD Beautiful Borders die was used with some coordinating patterned paper - showing only a portion of the border. PAPER: "Fiddlesticks" 6x6 pad from Miss Caroline collection by My Mind's Eye. 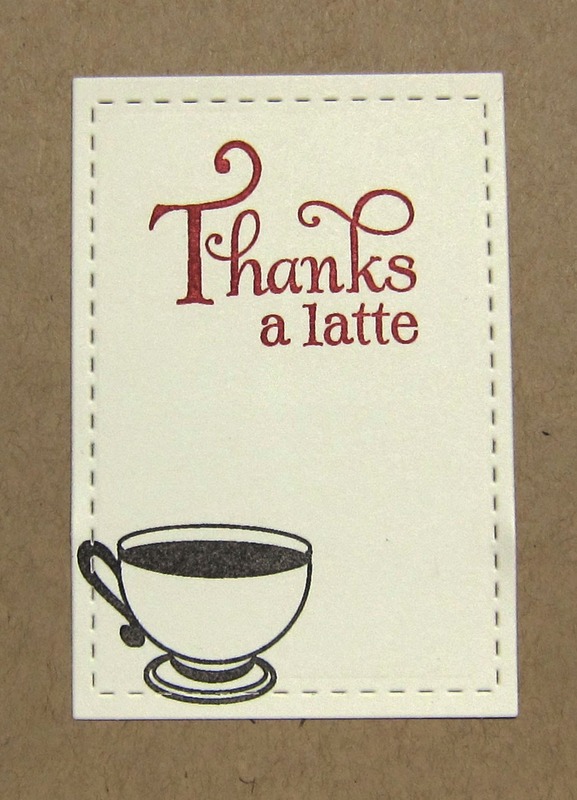 For my second project, I created a thank you card to give with a matching "denim" gift box that holds 8 K-cups. I took a manilla shipping tag and stenciled a tweed pattern in navy, then paper pieced and popped the new cup stamp with foam tape. 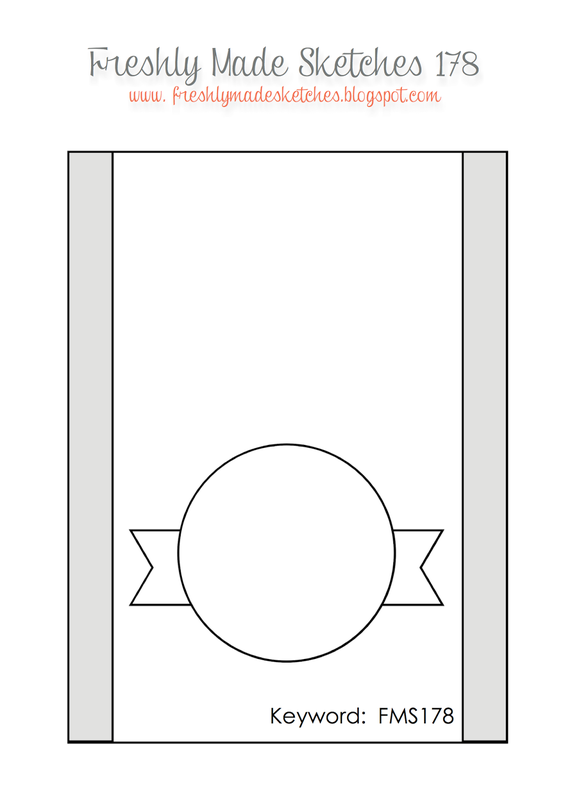 The sentiment was die cut with the same Pennant Die set used in my previous card. PAPER: "Summer Fresh" 6x6 pad by Simple Stories. 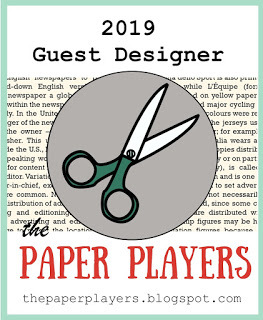 You'll want to visit the other designers' blogs below and leave a comment for a chance to win some new North Coast Creations goodies! 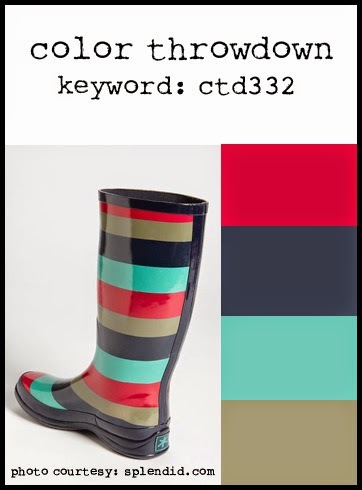 Check out these sweet colors brought to you by the fabulous Vickie for the Color Throwdown Challenge! Isn't that dress so gorgeous? 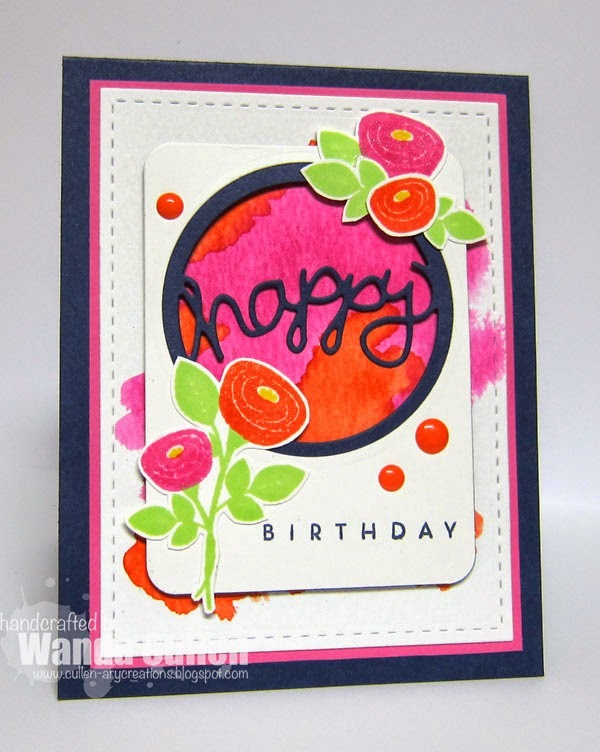 Of course, it was calling out for me to do a floral card...my favorite! The colors were also very close to the newest distress inks that were released in January and February - Cracked Pistachio and Abandoned Coral. Tim Holtz is releasing a new color every month this year and I've been itching to use them! I used a Copic marker - BG23 - to highlight a few of the leaves then water colored some Squeezed Lemonade ink around the image and added some dew drops. Remember those from many years ago when they were all the rage? My MISTI was so handy for perfect placement of the flowers (have I said how much I can't do without this new tool?!). The patterned paper is from the mini deck "DeLovely" 6x6 pad by Cosmo Cricket. 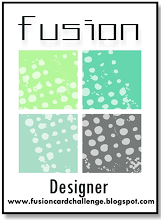 Facebook and get sneak peeks of the color swatches each week! 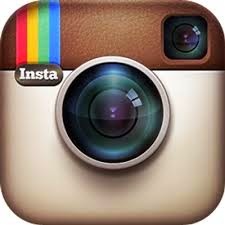 But now you can also follow us on Instagram, and get those sneak peeks, too! Be sure to search for us... colorthrowdown... and follow! 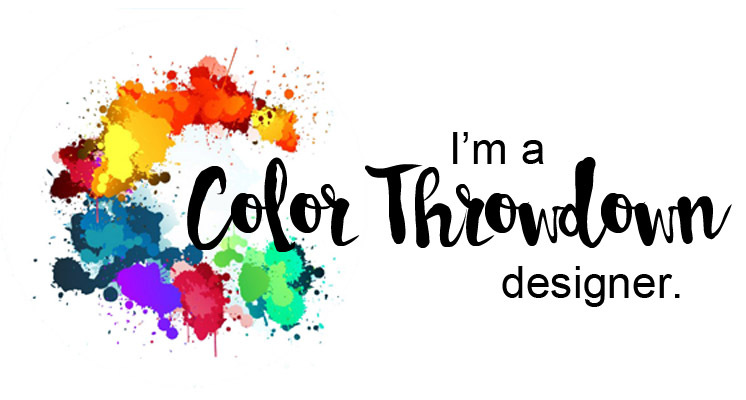 And when you post your CTD creations, be sure to use the hashtags #colorthrowdown and #ctd___ (insert the challenge number) so all the creations can be seen in one place! And who knows, one day you might find your own creation being featured on our feed, too! Welcome peeps! The upside of Mondays for me is the Mojo Monday Challenge and I've been a faithful follower for years! It's a wonderful way to start off my week and hope it is for you as well. This week, yours truly is bringing you another simple layout that you can dress up or down in a million ways! 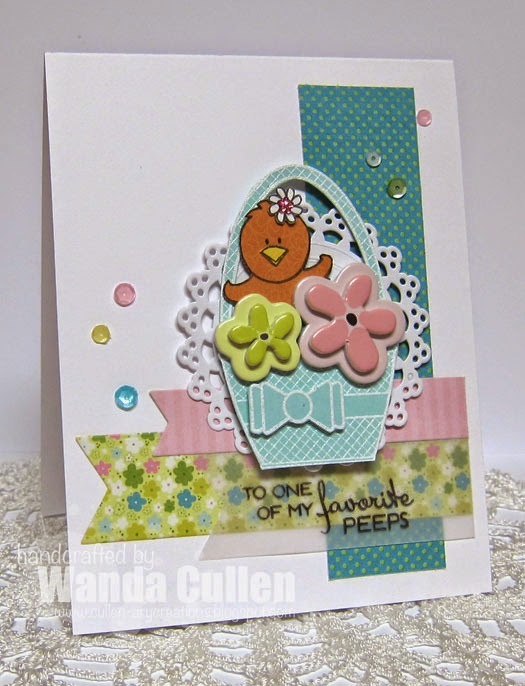 knew I wanted to use this fun basket and chick from Verve's Chicks Rule set. I layered up a couple of horizontal flags so I could get more patterned papers on the card. I didn't plan ahead well enough because I didn't leave quite enough room for my original idea to stamp the sentiment on the base layer, so had to go to Plan B and add another vellum banner. I paper pieced the chick and added some chipboard flowers and pastel sequins (from the Verve store). 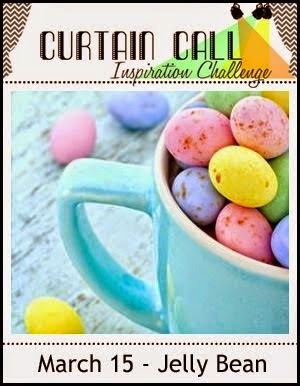 I was also inspired by the new Jelly Bean photo for the Curtain Call Inspiration challenge. Fishtail Flags Die-Namics by MFT. Good Sunday morning everyone! I'm playing along with the Retrosketches Challenge and I'm also giving you a sneak peek at a fun new set - Warm My Heart - that will be released in a few days by North Coast Creations! You will love it a latte! :-) Very simple with lots of layers and a paper pieced focal point. 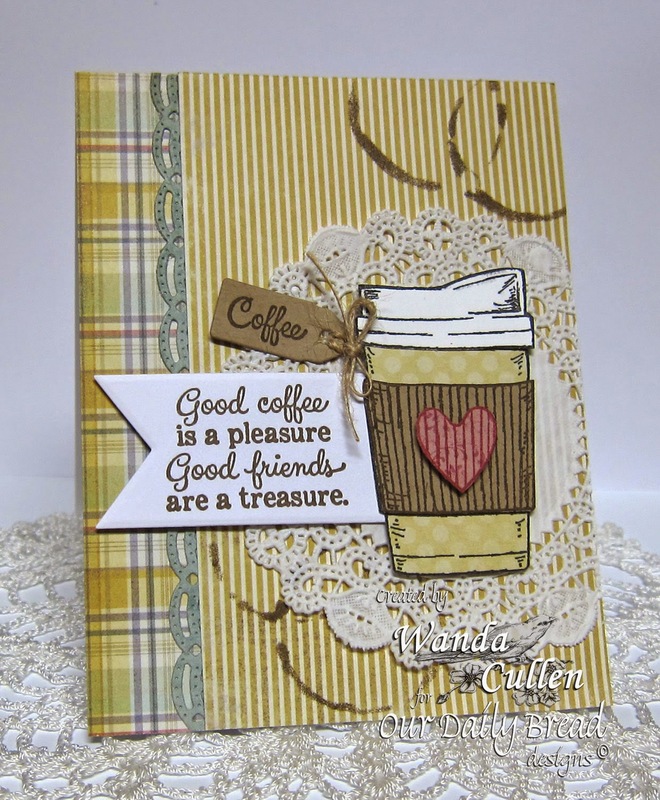 The sentiment on the inside reads "Good coffee is a pleasure, Good friends are a treasure." I thought these papers from 7 Gypsies "Venice" pad gave it a masculine flair. The tiny sentiment tag is a die from the Mini Tags set at ODBD. 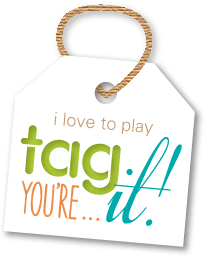 It's been a beautiful spring day...finally...and to wind down after a day filled with chores, I created this card for the Tag, You're It! Challenge while watching the Ohio State vs Arizona basketball game. 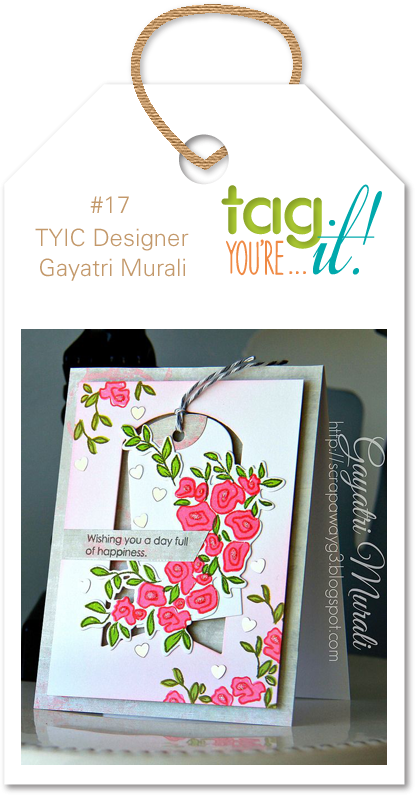 Gayatri created such a gorgeous card to CASE and I followed it pretty closely. 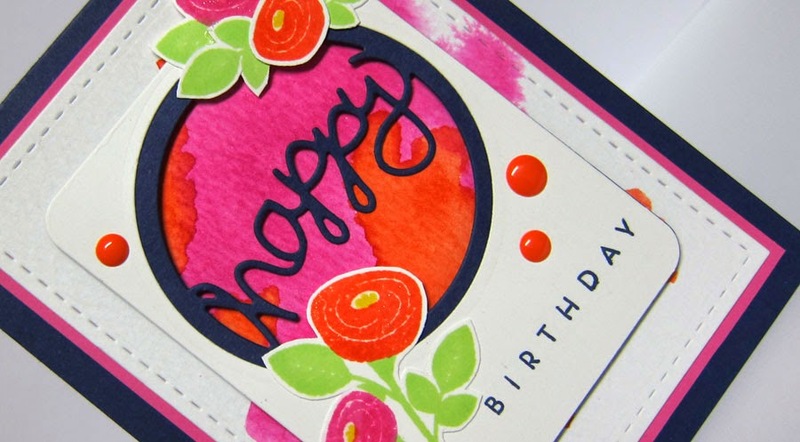 I used WPlus9 stamps (Spring Blooms and Strictly Sentiments), inks (Sweet Gelato, Wild Mango, Beanstalk, Mojito), and matching Spring Bloom dies in addition to the Timeless Tags 2 die. 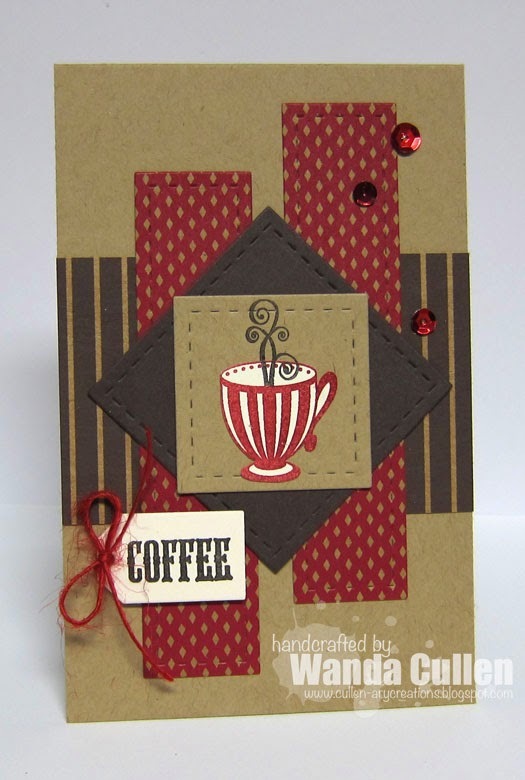 The stitched rectangle die is by Lil Inker Designs. Back to crossing my fingers and toes while the second half of the the game starts soon. Go Buckeyes! Today, we are taking a look back at the March release for Our Daily Bread Designs. 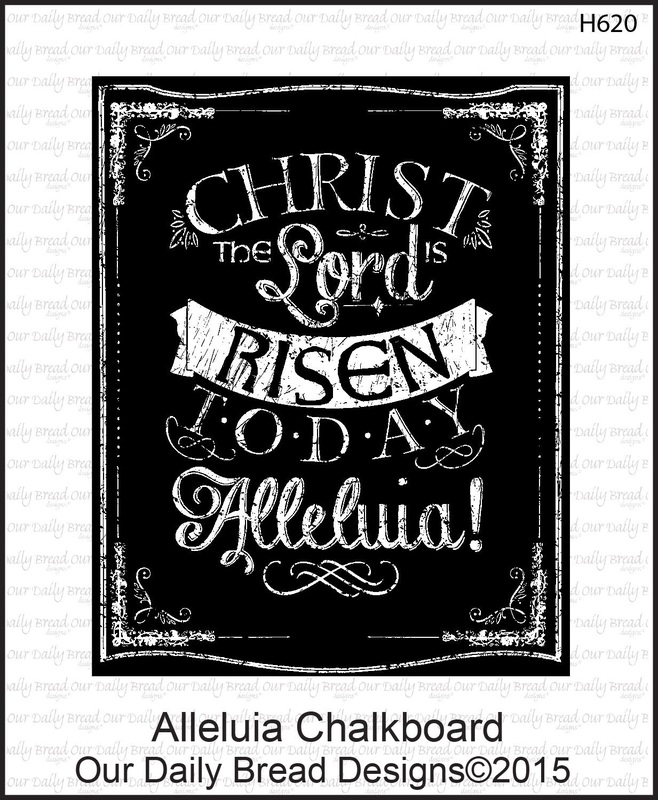 I am featuring the single stamp called Alleluia Chalkboard! For those of us who remember chalkboards versus smart boards in school, we know they were not always black. Some were green, so that's why I chose to ink this stamp with Versamark Oasis Green chalk ink. Borders die with Sahara Sand CS. 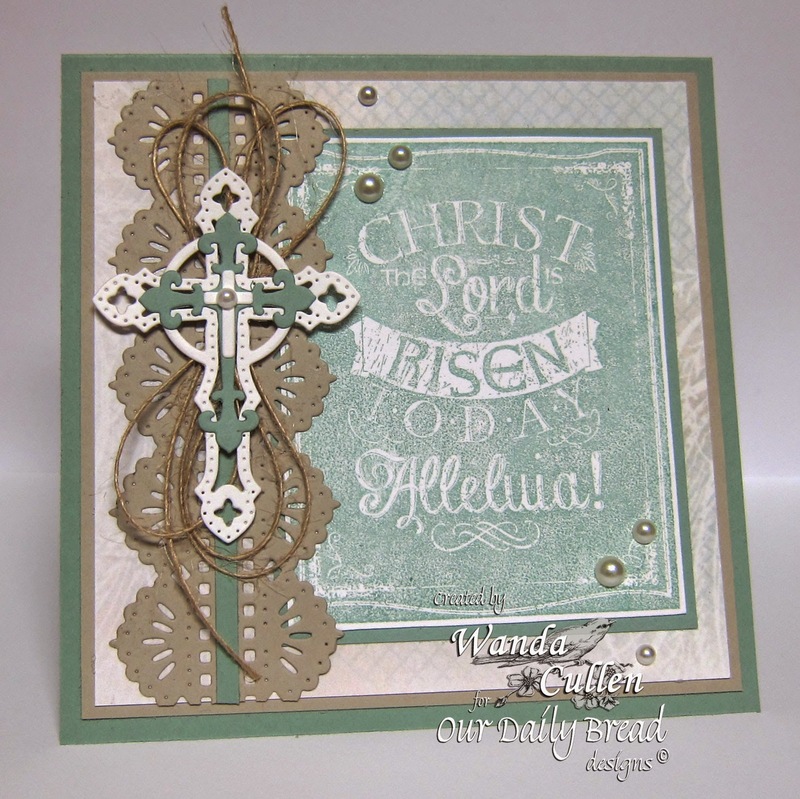 The ODBD Ornamental Crosses dies (I used 3 different sizes) were a perfect fit for the card's theme! 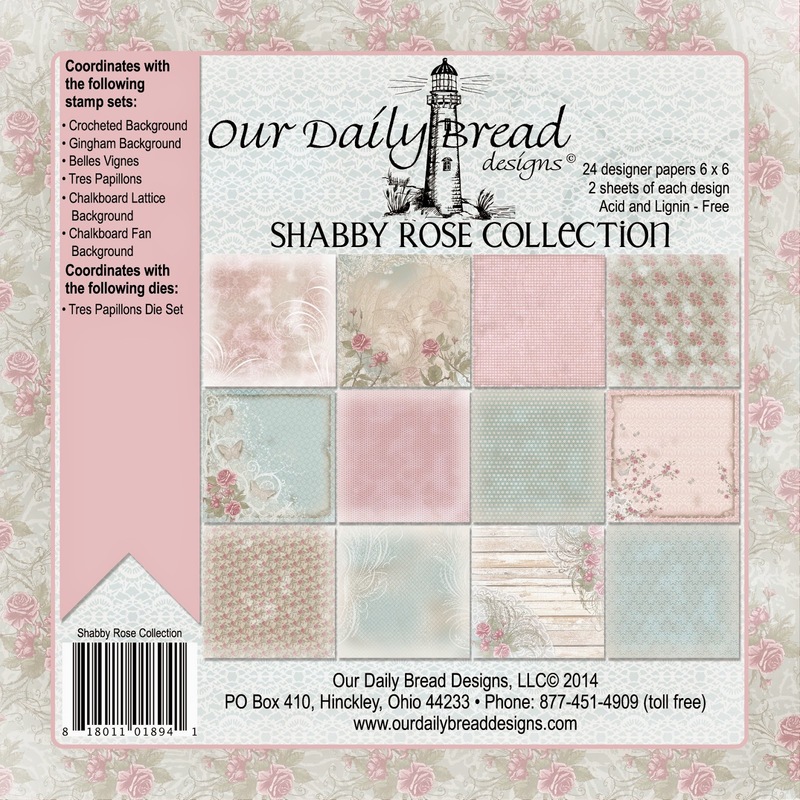 The designer paper is from the newly released Shabby Rose Collection which is perfect for those who love pastels. You'll want to check out what the other designers have created using products from the March release. You can visit the ODBD blog or you can click on their blog links below. Thanks so much for stopping by! 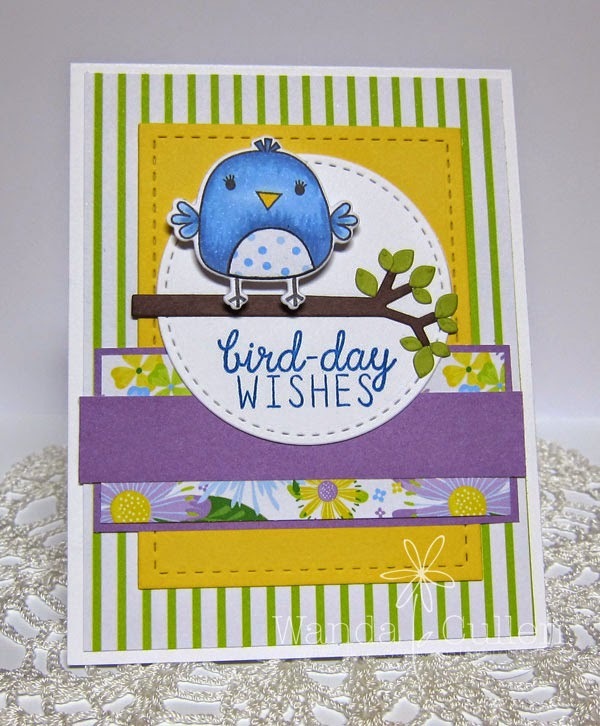 While I had this stamp set out on my desk, I colored up another blue bird and this time created a birthday card for the Sketch For You To Try Challenge over on the Reverse Confetti blog. LOVE this sweet set for spring! After coloring with Copics, I paper pieced his belly and die cut the image. I used my MISTI to place the sentiment (yes, I'm loving every minute I use it!). STAMPS: The Tweet Life by Reverse Confetti. PAPER: Craft It Flora by Recollections, Chocolate Chip, Old Olive, White. INK: Pacific Point, Memento Tuxedo Black. 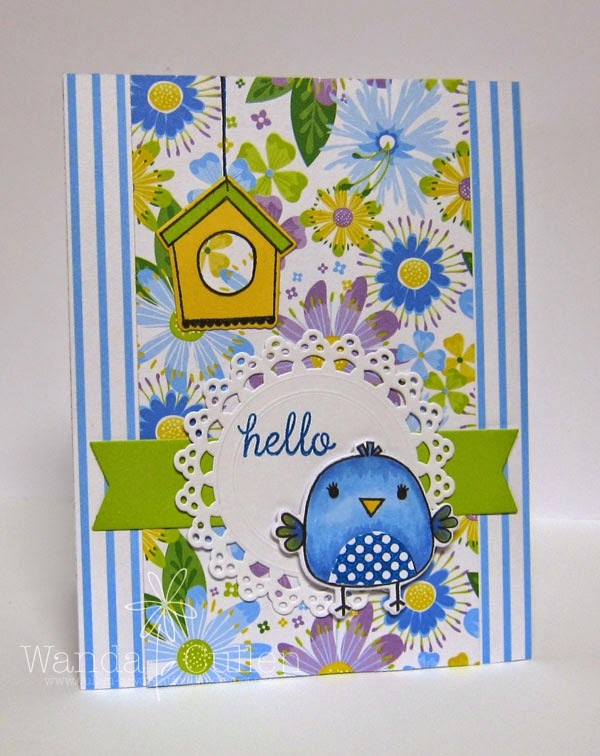 ACCESSORIES: The Tweet Life Confetti Cuts, Stitched rectangle and circle dies by Lil Inker Designs. While the birds are serenading me outdoors, I was inspired to use this adorable new stamp set - The Tweet Life - with coordinating dies just released by Reverse Confetti! I'm using the sketch for the current Freshly Made Sketches Challenge which was perfect to use these fresh springtime papers. I colored the image with Copics: B41, B45, Y18. The sentiment is stamped with Pacific Point ink (SU). Some paper piecing was also happening. 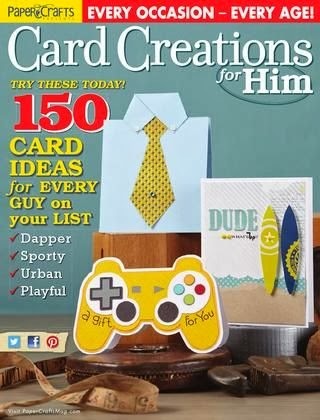 A quick and easy card to create! STAMPS: The Tweet Life (Reverse Confetti). 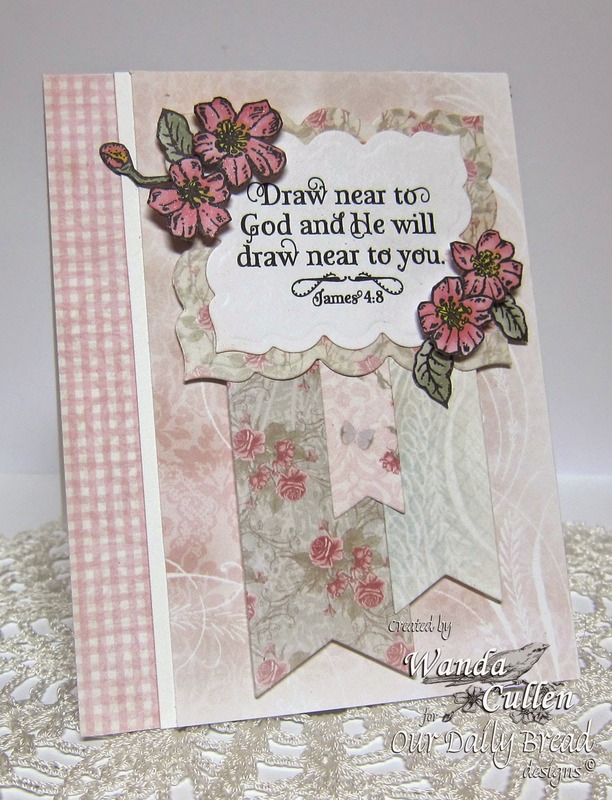 PAPER: Craft It Flora pad by Recollections; X-Press It Blending Card. ACCESSORIES: The Tweet Life dies by Reverse Confetti, Banner die by Reverse Confetti, Doily by Martha Stewart. Hi everyone and welcome to another Color Throwdown Challenge! 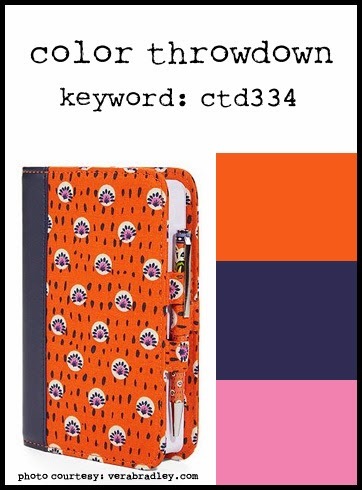 Tammy has some fabulous happy colors for us this week - inspired by this planner/journal cover! 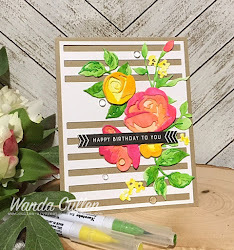 I was totally inspired by Betsy Veldman's sample card HERE for PTI's Bitty Bouquets stamp set release, so decided to CASE it for today's colors. I started with a watercolor wash using Tim Holtz distress inks (Ripe Persimmon and Picked Raspberry). I didn't want the "happy" die panel to be a solid navy, so I cut it twice - once in navy and once in white. I then took a slightly larger circle Nestabilities die and cut the white panel. I see I was a little off when I glued it together (yes, Freud has a name for people like me!). So, what do you think? Is it bright enough for you? :-) I finished it off by using a clear Wink of Stella glitter brush marker over the flowers and added some enamel dots. 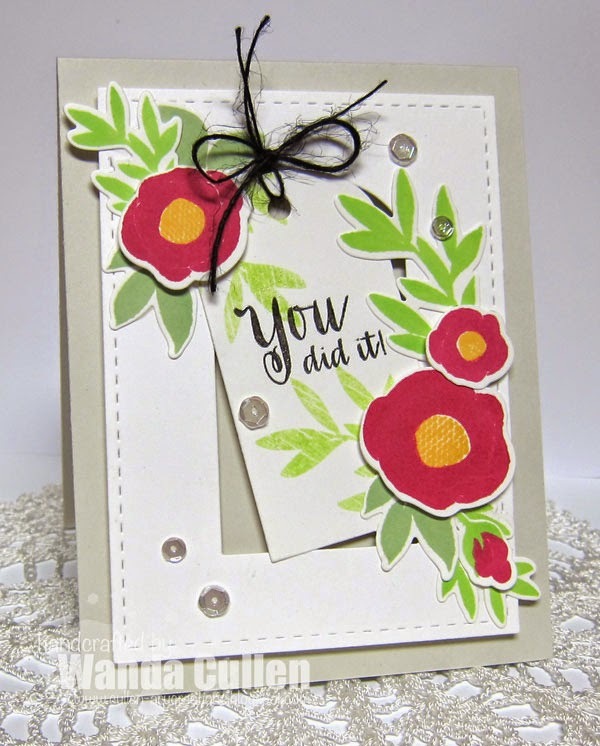 Congratulations to our guest star stamper this week - Julie Beech of Crafted by Jules. ACCESSORIES: Happy die by PTI; Stitched rectangle die by Lil Inker Designs, Enamel dots by Recollections. 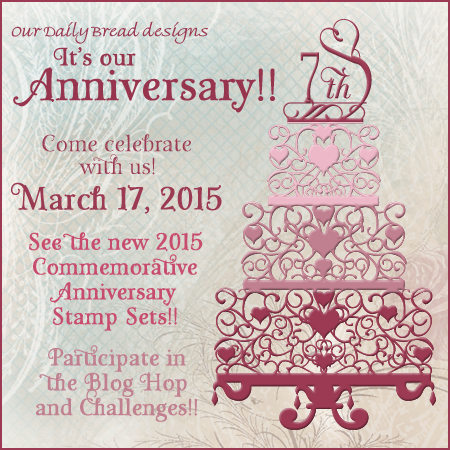 Happy 7th anniversary to Our Daily Bread Designs! To celebrate, the breadsticks (designers) are having a blog hop to bring you projects with a couple of special anniversary stamp sets - God Verses and God Quotes. To start at the beginning, head over to the ODBD blog so you don't miss any of the inspirational creations or you can click on the design team blog links at the end of my post. Seven randomly selected winners will each receive one of the new ODBD anniversary stamp sets just for commenting on the design team cards! You have until March 19, 2015 at 9:00 p.m. EDT to leave your comments on the designers' blogs for a chance to win! The winners will be posted on the ODBD blog on March 20th, so be sure to check back there to see if you won! I went with a monochromatic look and layered the Daisy Chain background die over a spring shade of green. My most used die from ODBD is the Fancy Foliage die set. 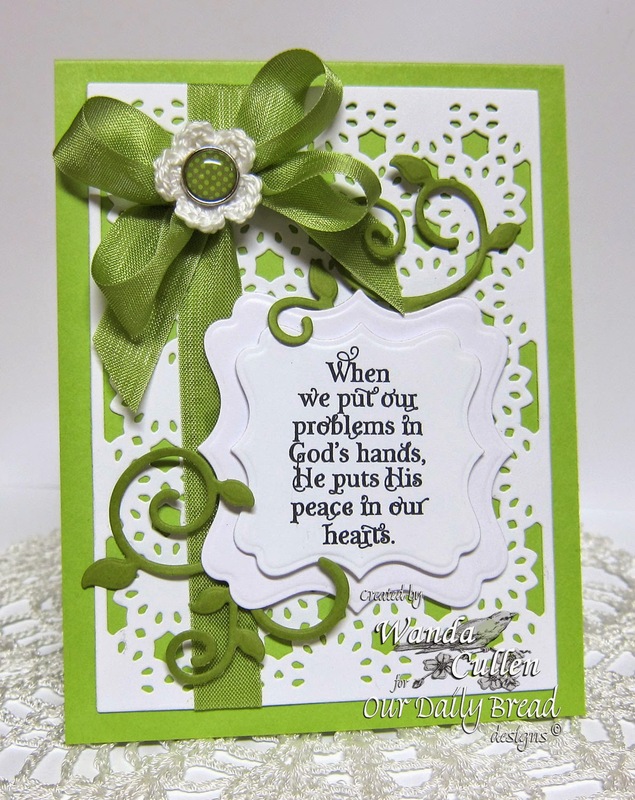 I especially love the leafy scroll die that I cut in half and looped around the sentiment. Handy Tip: For any intricate dies, I layer a cutting plate, dryer sheet, cardstock, wax paper, die, cutting plate before running it through the Big Shot. The Spellbinders Tool-N-One also makes it a cinch to clear out all the tiny paper pieces...and...it's available in the ODBD store! I couldn't stop with just one card. I switched gears from bold and bright to the pastels of the beautiful new papers from the Shabby Rose Collection just released this month. The sentiment is framed using Spellbinders' Labels Twenty Three Nestabilities. The flowers and leaves (from ODBD Cherry Blossom set) were colored with Copics and fussy cut. I used a clear Wink of Stella shimmer marker to add some subtle sparkle to the blossoms. We're marching along and we're closer to spring - 4 more days to be exact! We also have a great new sketch by Julee for the Mojo Monday Challenge! I love these sunny papers in this Classique: Beauty 6x6 pad by Authentique. STAMPS: Be Blessed (Verve), Bloom and Grow (Verve). INK: Daffodil Delight, Lucky Limeade (SU), Versafine Onyx Black. ACCESSORIES: Stitched square and rectangle dies by Lil Inker Designs; Petal Points, Elegant Leaves and Sprightly Sprigs dies by Verve; Brad by Recollections; Enamel dots. ODBD New Release is Here!